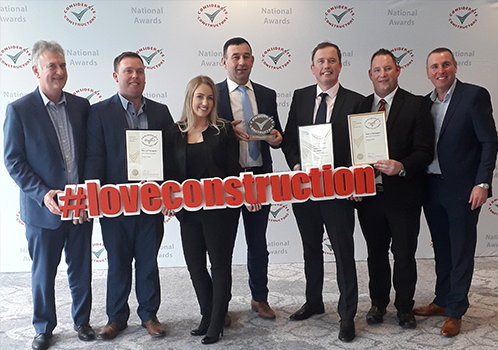 Congratulations to the site teams from the Morgan Hotel and The National Rehabilitation Hospital (NRH) for their fantastic achievement at the Considerate Constructors National Site Awards in Manchester. The Morgan Hotel received a Gold Award and ‘Most Considerate Site’ runner-up, and the NRH received a Bronze Award. Winning a Most Considerate Site Award runner up places us in the top 30, out of approximately 8,000 registered sites across the UK and Ireland. Both projects were recognised for exceptional standards and innovation from the Considerate Constructors Scheme, which aims to improve the image of the construction industry and focuses on areas such as site appearance, respect for the community, safety, protection of the environment and valuing the workforce.